Has every day become a Monday morning to you? If you desire your job to be more than just getting a paycheck, you’re in luck. 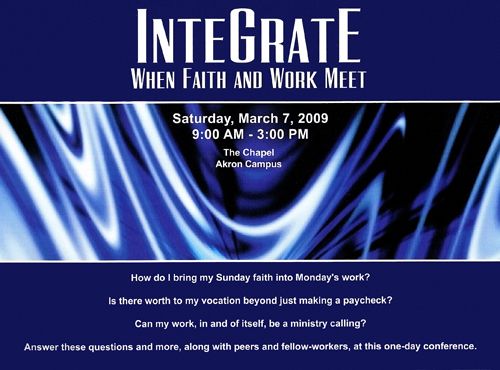 Integrate: When Faith and Work Meet, is a conference designed to do just that. The whole idea of the conference is learning how one can integrate their faith in every aspect of their life – specifically on the job – creating a good reason to get up every morning. “Everybody should be able to look at their work as being ordained by God. Whether it’s shining shoes, cleaning the floor, filling cavities in a mouth – whatever it might be – this is the work that God has given us,” Jay Halley, Missions coordinator at the Chapel said. Questions such as “How do I bring my Sunday faith into Monday’s work?” and “How do we as Christians integrate Christ into every part of our lives?” will be answered. Two men; Jay Halley, and Bob Robinson of Christian Coalition Outreach (also a member of the Chapel), collaborated, creating this conference to help people make the most of their work experience. They aspire to show people how to make their workday more meaningful than just punching in a timecard. Halley, with a heart for missions, is concerned about not only worldwide missions, but local as well. And what greater a mission field than the workplace? 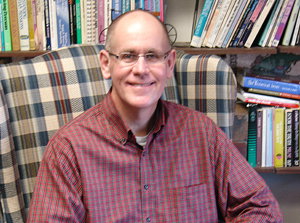 His passion is to see the Body of Christ integrate Christ into every area of their lives. “I would love to see hundreds of people come and be reminded of how Christ can have a critical part in every area of their lives - including the workplace where they spend a lot of their time,” he said. Something new on the horizon for the Chapel – they have never had a conference quite like this. 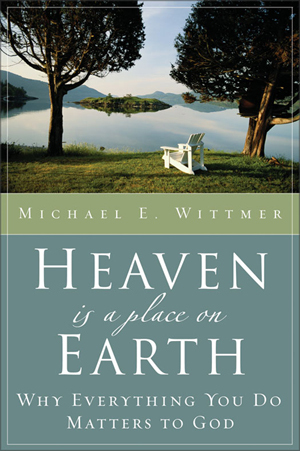 Michael Wittmer, author of Heaven is a Place on Earth: Why Everything Matters to God, will be the keynote speaker. They will also have break out sessions to focus in on specific vocations. Esteemed individuals in the community known for having strong Christian character will facilitate the different discussions according to their area of expertise. The plan is to provide the opportunity for people to meet others their field and find encouragement in their work. “I think it will be very energizing for people who are likeminded in their vocations to come together and talk openly,” Halley said. Also, first Corinthians 10:31 states that whatever we do we should do it all for the glory of God. They also hope to answer questions including why God created work, how we can glorify God in our work and how our work has a part in the working out of the gospel of Jesus Christ. One thing Halley makes clear is that this conference is not about evangelism in the workplace. It is important for believers to remember to take what they learn on Sunday at church and apply it to their everyday lives. “People think of the church as the building and it’s not the building. The church is people, its believers,” Halley said. If you’re interested in helping out with the conference they are looking for people in the workplace to participate and lead (and you don’t have to be a pastor)! The conference will be held on Saturday, March 7, 2009 from 9:00 AM to 3:00 PM.